This is a very special posting to allsandwich, because it's a one-off sandwich that we will likely never taste again. It's a damn shame, too, because it's one of the best banh mi sandwiches we've ever tasted. Just yesterday we got the news that chef Joe Swan is leaving his post at the brilliant French bistro Marche Bacchus. This, too, is a damn shame, because he's a very talented young chef who has seemingly done the impossible by improving the already stellar menu at one of Las Vegas' favorite neighborhood restaurants. Recently, Swan and his team hosted chef Jet Tila for a one-night-only collaboration pop up dinner, featuring dishes with a French-Asian twist. 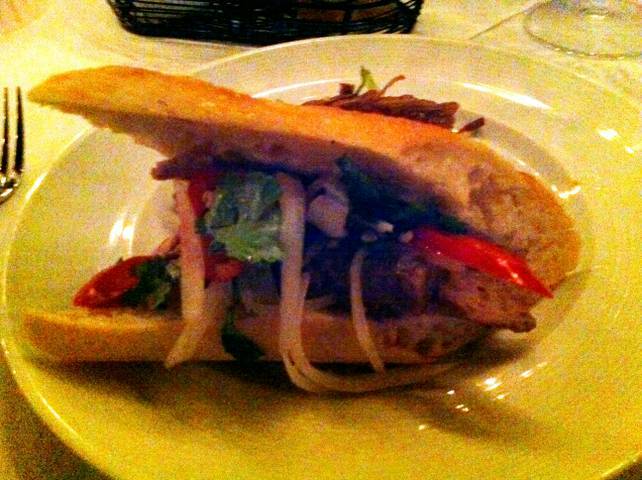 The "Swan Mi" was one of the highlights: house-made pork and duck liver lop cheung, pate, garlic aioli, mimolette, and Sichuan pickled daikon and peppers on the always-perfect Marche Bacchus baguette. It was a crispy, crunchy, meaty masterpiece, a wild combination of flavors of textures. It was delicious, so good that after a few too many glasses of wine we found ourselves in the parking lot yelling something like, "You should start a Marche Bacchus Swan Mi food truck!" Best of luck to chef Swan; we hope sometime, somewhere, someone else gets to eat this wonderful sandwich.